For today’s film, I wanted to watch a different genre than I have all October. I have had the chance this year to sit down and enjoy exorcism, vampire, and psychological horror movies but I haven’t had the chance to watch anything in the zombie realm. Also, although The Walking Dead is immensely popular, I have only really seen the first season (I love the books so much and I haven’t had time to wade through the rest of the series). I decided today that since there are only two days left, one of them should be devoted to zombies. I struggled with myself on whether I should watch a classic like George Romero’s Night of the Living Dead or Dawn of the Dead, Zach Snyder’s brilliant remake of Dawn of the Dead, or Danny Boyle's wonderful 28 Days Later, but instead I wanted to watch something new. I searched online and found a film that was regarded very well by critics and also happened to be on Netflix. 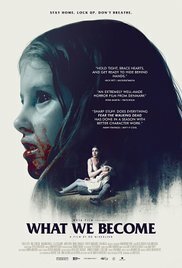 I put my daughter and wife to bed and settled in to watch this Danish horror film: Bo Mikkelson’s 2015 movie What We Become. This film follows a family of four who are quarantined in their homes while a virus rages outside the walls. They are not allowed out of the house and are basically being held prisoner by nameless, faceless military personnel. Gustave, the older teenage son is infatuated with a very lovely young lady, Sonja, who lives across the street. Before the quarantine, they meet and begin a friendship that Gustave hopes will lead to more. Then, things begin to happen and Gustav must worry not only about his father, mother, and little sister, but also about Sonja and her mother. First off, the movie is beautifully filmed. If I had to guess I would say they used a RED camera as everything is so crisp and clear and has the quality normally associated with that equipment. The colour palette is somewhat muted, giving the same sort of look as other Scandinavian films like Let the Right One In. The muted colours are amazing when blood finally shows up as the red pops against the greys and blues. The performances are serviceable. In a film like this, there isn’t really a need to be incredible but in their roles each actor and actress does what must be done. The parents (Troels Lyby as the father and Millie Dinesen as the mother) are very convincing as both concerned authority figures and concerned citizens. Benjamin Engell (Gustave) is also pretty good, playing an angsty teenager with enough anger to come across as convincing without going over the top and becoming corny. Sonja (Marie Hammer Boda) is beautiful and vulnerable and plays her part wonderfully. For my money, the best character was probably Maj (played by Ella Sollgard) because even though she is probably only eleven or twelve, when she turns, she is downright scary. Lastly, I need to talk about the music. It is amazing. It is jarring at points, soft and sweet at others, and even clinical and precise. Martin Pedersen provides a score that is everything this film needs and more. I was especially fond of the credit sequence which had a nice feel to it, like a reference back to The Exorcist or Insidious. This is a film score that I am hoping to track down and listen to on its own. Overall, while it may not break new ground, What We Become is another solid addition to the zombie genre, providing a slow exposition and a nice, violent resolution of sorts. Actually, as zombie movies go, I was a huge fan of the ending of this film. If you are looking for something that isn’t over-the-top gory or scary but still has elements of both, then this is the film for you. Check it out on Netflix now and enjoy this Danish offering.